Help the train conductor find out which note the train needs to stop at. 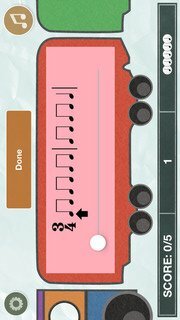 In order to find the right stop, you'll need to listen to a rhythm while reading the notation displayed on the train, then select the last note you hear. The train conductor will be forever grateful! Tonic Tutor keeps track of your game results, including detailed information for each question you answer. Find out how you're doing over time: tell at a glance what you need work on and see how much your skills are improving!